It's been one year since I started writing this blog. I have to tell you, it has been great therapy, and it keeps me off the streets at night. This whole experience has been a learning one. After a year of writing, I am only now learning to walk. I chose the title of Thinking Out Loud In Sturbridge because that is exactly what this space is all about. All those thoughts that one normally thinks, and then shuffles off to some quiet corner of ones head I choose to put out there. Why? Well, I think that a lot of those thoughts deserve to be seen by others. Exposing my inner most thoughts is a great cathartic. They are good enough to share. Then there are other thoughts that only confirm that I may need medication. I like those thoughts the best. After living in town for a while I wanted a venue to share the ideas I had with an audience, and maybe, if the those ideas were sound, they would gain a life of their own. Over the past year, some have, and some haven't. The speed limit situation here on the southern end of Route 148 is still a stickler, but I have come to the realization that even the most well meaning people can become paralyzed with inaction because they don't really know what to do, so they "hide" away and ignore the issue. My intent was never to change my world, but rather to share. Sharing an idea, or thought can foster change as well. Sometimes when we hear, or read of someone that has a similar view as us it confirms that maybe our thoughts aren't too far off. I have received a lot of comments that support this. It's good to know that I am not "too far off" on a lot of my thinking. There were other times, over the past year, when I enjoyed just being silly. As I said above, my thoughts have a way of leaking out onto these pages, the good, bad and the silly. No pretensions here. One of the things that I most enjoy is writing about our town of Sturbridge, its past, where we are now, and where we could be in the future. Seems a lot of you enjoy those thoughts as well according the the survey currently being taken on this space. More on the survey results on a later post, but be assured, I will write a lot more on our history over the upcoming year. What is happening here in town at the present is something that always gets a good response from readers. Writings on our environment, our woodlands, our roads, and businesses all seem to touch a nerve, as do the visions of Sturbridge in the future. One thing I will continue to write about is the silliness, stupidity, ignorance, laziness, of folks in town whose actions either hurt us as a group, or individually. Can't help it. I think that my sense of what is right, and what is not right is quite good. Why? Well, if we ignore the questionable behavior of some, and don't react to it, then it is as good as condoning it. Someone has to speak up, and it might as well be me. There isn't another forum around that lets one express themselves about issues of behavior regarding our officials, residents, and businesses. People have to know that their are consequences to there words and actions, no matter how benign they may seem at the time. I do hope that these writings will be few. I do respond to what I see and read, and I do call 'em as I see 'em. That being said, I will also continue to recognize those that do us all proud. The individuals that are often overlooked, or get lost in the shuffle of everyday life, and sometimes yesterdays fools, can be tomorrows standouts. So, here I go onto a second year of exposing myself on the web. Wait. That does not sound good. Let's try again. So, here I go onto a second year of exposing myself on the internet. Survey results will be posted on a future posting. This Thursday is our traditional time to give thanks for all we have in our lives. I always thought that appointing one day to give thanks was a bit odd, but there is far more to the day. We are celebrating the Pilgrims that survived that first year in Plimouth, and their giving thanks for their survival. So many of them did not survive that first year, and they may have all perished if it were not for the Wampanoag. The Pilgrims took those bad times and built from them. Having their heads all in one positive place helped to insure they were all on the same page. A celebration of communal survival was something they could all be part of, and also set the stage for the times that were to come. A football team doesn't usually celebrate a loosing season, but they should. They may not have made it out of the season in one healthy piece, and may have not made the best of choices during the year, but they finished, and the experience was something to learn from. Instead of going their separate ways after the last game, and reuniting the following July, they should celebrate, and give thanks for what positive things did happen. Acknowledging the negative things, as well as the positive is the very best way to insure that the mistakes of the past are not made again. The Pilgrims grasped this concept. But, getting back to that one-day-a-year thing. It is a great way, and excuse, for rounding up family and friends, dressing up, and sharing a meal. The day is a low key one. We need that. Our lives are too crazy. We need to shut down, and take the time to let our bodies, and minds have a holiday. I think it is great that most businesses are shuttered on Thursday, and Friday. This way one is not stressed to catch up with life the following day. You can do that on Monday. Yes, we need this one day a year to shut down, and when we are sitting in that comfortable chair, watching the Macy's parade, and waiting for the bird to come out of the oven, look around, and start acknowledging the things in your life. Start giving thanks then. Give thanks for your being there in the first place. You survived another year. Then seek out your partners face in the room, and give thanks. The little faces spread about the room, the older ones talking in the kitchen, the table that is set so nicely, and waiting for the meal, the seven year old van in the garage that hasn't failed you yet, the roof that is not leaking, and anything else that has touched your life. Acknowledge it all, and give thanks. When we place our minds in this place, and take an accounting of all the things that are in our lives that are good, and the things that weren't so good, but we learned from, we become that much more enlightened. Although we set aside the last Thursday of November for our giving thanks day, don't let that stop you from giving thanks the remainder of the year. Give thanks each time you arrive home safely, when the flu begins to break up in your little one. Give thanks that there is at least one meal to be made still in the cupboard, and you have two quarters for a newspaper. Take nothing for granted, the Pilgrims didn't, and neither should we. She's 22 years old today. I remember everything about the day she was born. Everything. The days, weeks, months and years that have come, and gone since that day I am blessed to have been able to store away as wonderful memories. She's in her last year of college now. Far cry from playing with her Pocket Pals on the dining room table, and watching the Littlest Mermaid over and over again. Dance lessons are history. The American Girl Dolls are neatly packed up so that she can share them her children someday. Those countless plastic Disney little people, that we collected together, fill a few large popcorn tins somewhere at home. I still have a clothespin she taped a piece of fabric to and drew a face on the top. She made me a little person to play with so I wouldn't feel left out. She's 22 today, but she will always be my little girl no matter how grown up she becomes. Dads have that right. NEW BEDFORD — If you are traveling by car this Thanksgiving, especially if your trip will take you on the Massachusetts Turnpike, you might want to leave as soon as you finish reading this. Tuesday, said Holly Sutherland of the Massachusetts Turnpike Authority, is no longer the easy traveling day that it once was. Better to leave at daybreak on Thanksgiving, and certainly not after 10 a.m. on the big day. "We're basically asking people not to try to travel during Wednesday," Ms. Sutherland said. But that won't change the fact that many people will. The Pike will be jammed "just about all day on Wednesday," she said. Those people will almost certainly enjoy an hours-long look at the bare-trees scenery approaching the tolls at Exit 9, which connects the Pike to I-84 in Sturbridge. The Turnpike Authority is strapped for cash, and there is no intention to clear the bottleneck by allowing motorists to use Exit 9 for free. Here in Fiskdale the animals are taking over. Well, not exactly taking over, but maybe just taking back what we took from them. They're bold, and humans don't seem to bother them much. This can be viewed as a wonderful "country thing", and it can be a bit disconcerting as well. Last winter I discovered tracks in the snow out in the backyard, and after doing a bit of research, I found them to be coyote tracks. Just 20 feet from the house. I didn't see the coyote then, but about 3 weeks ago, I did. I was standing on the back porch about 10 PM, when I heard a rustle in the leaves about 25 feet to my right, then a coyote walked across the back yard about 20 feet from me. I moved my arm and it drew his attention. He turned and looked at me then bolted off towards my neighbors yard at warp speed. Amazing. We have a couple of feral cats that live around the house. One black and white one, a calico, and sometimes there is a white with black spots cat that shows up and wanders through the yard. After seeing that coyote that night I figured the cat population would drop sharply. It hasn't. Feral cats are clever, and survivors. A week or so after seeing the coyote I came out onto the back porch again and off to my left, about a hundred yards away near my neighbors driveway was a deer grazing on berries. I walked a bit closer, and stood very still by my well. the deer picked up it's head, stared in my direction, but didn't see me. I was down wind, as well, so I never tipped my hand. I went back inside and grabbed the camera, took some shots and watched as she grazed along the hillside and up towards the neighbors barn, and then disappeared. It was mid morning. Yesterday morning I went out to my truck, and noticed a car driving very slowly in front of my house. 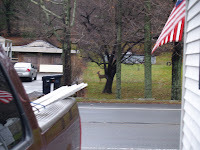 After it passed I saw two young deer across the street in another neighbors yard, about 25 feet from Route 148. They were eating fallen crab apples and whatever else young deer eat on a Sunday morning. They picked up their heads, looked over at me, and then resumed grazing. They couldn't have been more than 80 feet away. The photo above, although a bad one, shows one of the deer, the other was hiding behind the tree. I watched them for a bit, took some pictures to prove it to Mary, and then went back inside. This was 8:30 in the morning. Later, around 4:00 PM, they were back in the same place, grazing, with Route 148 traffic only feet away. They were not afraid. I expect them to come knocking on the front door next looking for handouts. Last summer there was a photo in paper of a black bear taken about a mile north of me on Route 148. I love wildlife, and I know that they are out there, but I have rarely seen them around the house till recently. Maybe they are just more comfortable with me. Their populations are increasing, and they are becoming bolder. We don't seem to bother them as we once had. There is a chipmunk that lives in the window well of my cellar window. He has escape tunnels all over the yard, and a certain shopping route he takes most days. He'll walk in front of me if I am sitting on the back steps, and not be phased by my presence. In fact, I think he is a bit too bold. He'll walk by me, stop for a second and stick his tongue out in my direction, and proceed on his route, cheeks all loaded up with spilt bird seed from the feeders. I know that we encroached on the animals long ago, then they, seeing that we had become essentially harmless, except for those wearing orange in the fall, decided to come back. The deer do little other than ravage our orchards, gardens and the bark from the trees in our yards. Deer fencing helps. The coyotes, on the other hand, have made a tremendous comeback, and our refuse, cats and small dogs are fair game for them. I wouldn't leave a small child in the backyard alone, either. Then there are the turkeys. These guys are the boldest of them all. They'll find a spot, maybe your yard, and call it home for days on end while they eat everything edible there is to eat. If you approach them, the leader of the pack, the Tom, will let you know in no uncertain terms, that you are an interloper. He'll swagger over towards you, in an attempt to lead you away from his harem, and if you don't back off, he'll attack. You don't want this. Turkeys are big, and their talons are sharp. We were driving along Champeaux Road last summer when we saw a bunch of them on the side of the road. We slowed down to enjoy the site when a Tom came over to the car, lifted his head up high enough to see who I had in the passenger seat, and simultaneously walked along side the car at 5 MPH. As I sped up a little, he kept pace. All the while lifting his head, and checking out Mary. I wasn't sure if he was just curious, or checking out a prospect to add to his herd, but he seemed to get a little agitated as we drove along, and gradually increasing our speed. After a bit I looked into the rear view mirror and saw him in the middle of the road, tail feathers all puffed out, head snapping from side to side. I think we just made it out of there in time that day. He looked like a cocky gang banger that had just protected his turf. I don't want to tangle with a turkey, unless he is lying quietly on some bone china surrounded by potatoes and parsley. 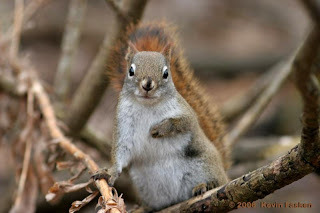 Then there are the Red Squirrels, but I'll save that adventure for another time. They could still be watching me. I 've been thinking. I know, I know, but I've been thinking about this for awhile, and I want to put it out there. Here in Sturbridge we have a great small town. Problem is that the businesses and retail stores in town are spread all over the map. We don't have a real downtown. Town offices sit off by themselves, the Post office does the same. The stores for groceries and sundries are off by themselves in plaza's on Route 20 and down Route 131. Fiskdale does have a lot of stores on Main Street, however most are specialty shops, insurance agencies, restaurants, a convenience store, and one small grocery store. We certainly ain't a walking village despite our small population. This got me wondering about those folks in town with limited transportation. How do they take care of their day to day errands without a car? Do they wait for once a week transportation to the supermarket, and try to accomplish what they can all in a space of a few hours? Do they rely on neighbors, and family? Where's the independence in that? So, I was looking at an old photograph of a trolley car in front of the long gone Fair Grounds on Main Street, and it hit me: we need a trolley. Not an actual ride-on-the-rails-trolley, but a trolley car like the other tourist towns in Mass. have. One that looks like 1903, but with windows that close to keep out the weather. And, it could run on natural gas, or propane. We could start out with one trolley on a scheduled route from Fiskdale down Route 20, onto Route 131 towards the Southbridge line, and then back down 131 again to Hall Road to Route 20 and on to the Hobbs Brook Plaza, then back to Fiskdale again. This would be the rough route, it could be adjusted depending on where the need exactly was. 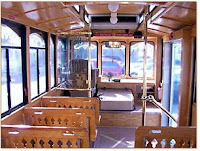 A schedule would be made, and the trolley would follow that schedule from morning to late afternoon. The fare would be reasonable. One could buy books of tickets in advance. There could be one price for residents, another for day trippers. It would be nice if the t own took on the role of running the trolley, but with the economy as it is, I don't see that happening, but it could be something that a private group could do, and with the resources we have here in town, do very well. First, we do a search for a "previously owned" trolley. They're out there. Just Google it. Next, once we get an idea what they are costing, we raise the funds. Once we obtain the trolley we bring it on home to Sturbridge, and with the help of skilled volunteers in town, we get 'er on the road. During this time, the private group has become either a corporation or a charitable foundation, meetings have been held in regards to planning, fund raising, laying out the route, and establishing the fares. Expensive endeavor, but not insurmountable, the used trolley's run around $50,000.00. Donations and fares could very well pay for it. A large corporate donation could get their name on the trolley, and all the advertising they'd want. A trolley would mean freedom for so many folks here in our "spread-all-over-Creation" small town. Just imagine tourists scooting down Main Street to all the different shops they'd otherwise miss, residents taking off for a picnic at Westville Dam, or taking the kids to Streeter Beach Recreation area, all without a car. Not only a great idea, but a green one as well. Just a thought. Now, go back to reading the Sunday paper, but take a turn thinking on it, too. Click here to view used trolleys for sale. Another web site that has used trams and trolleys for sale.